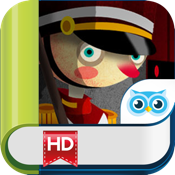 The Pickatale Club is proud to introduce your child to The Steadfast Tin Soldier. A one-legged toy soldier faces many misadventures before returning home to his beloved ballerina. We make reading more exciting with great voices and balanced interactive features. A toy soldier falls in love with a beautiful ballerina dancing atop a jewelry box. The ballerina is coveted by a wicked goblin who pushes the soldier out a window to a frightening world outside. The brave soldier faces a rat, is swallowed by a fish, and finally ends up back home. This steadfast soldier has but one leg, yet he outwits his enemy and wins the ballerina’s heart. The original story was written by Hans Christian Andersen in 1938.